Labor Day represents the functional end of summer (back to school, back to work). As such, we want to highlight a number of themes that we have been discussing over the summer months and give an update with respect to Heritage portfolio views. One of the most powerful themes playing out in the market over the entirety of this bull market cycle has been investors’ persistent desire to own growth stocks. While the rationale for owning growth stocks in a lower growth environment is intellectually consistent – the market will pay up for higher growth when growth is scarce – the current strength in underlying economic fundamentals suggest the potential for a shift in leadership in the domestic equity markets. As the graph above depicts, the outperformance of growth stocks relative to value stocks has resulted in relative valuations approaching levels not seen since the tech bubble at the turn of the century. 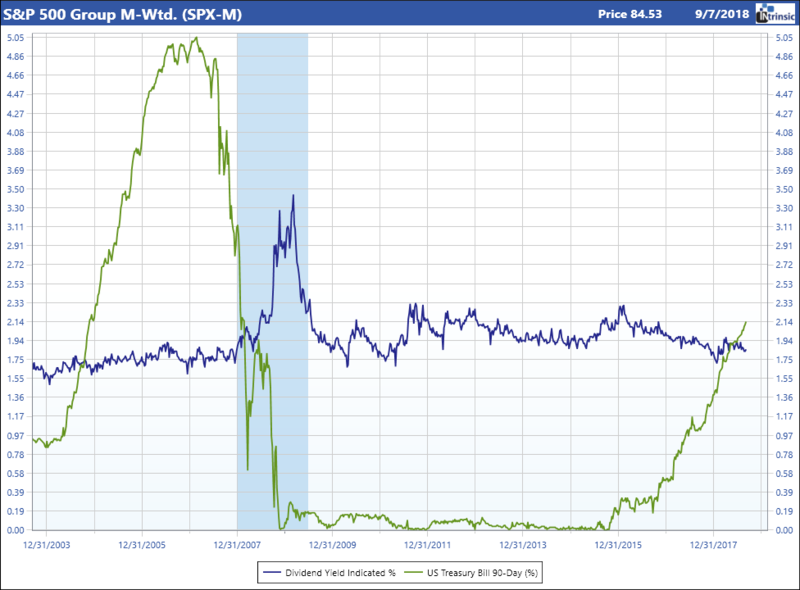 This divergence in performance can also be seen when we look beyond the broad market returns into the market internals. While US stock markets hit new highs to end the month of August, performance has been concentrated in a limited number of sectors (technology, healthcare and consumer discretionary). In the S&P 500, concentration is even greater with five stocks (Amazon, Apple, Microsoft, Alphabet and Netflix) accounting for 47% of the year to date return. While this concentration gives us pause with respect to market risk, the average stock in the market appears less extended. As an example, the average large cap stock is 10% below its 52 week high, the average mid cap stock is 12% lower and the average small cap stock is 13% lower. Similarly, the divergence of performance in the Heritage Concentrated Equity portfolio may support a modest rebalancing of portfolio holdings. The summer of 2018 has seen a shift in the global economic outlook as slowing growth in international economies has called into question the synchronous global expansion that propelled global markets higher in 2017. The negative impact on global economic growth from European challenges (Italian debt, Brexit), tariffs (China) and a stronger US Dollar (emerging markets) coupled with continued stronger earnings growth at home suggest a bias towards domestic markets is warranted. Consistent with this view, we shifted portfolio equity exposure out of emerging markets and international small cap stocks earlier this summer while lowering exposure to global bonds in August. The combination of stronger domestic economic growth and higher domestic interest rates should continue to support a modestly stronger US Dollar. As such, we continue to hedge a significant portion of our international equity exposure against a stronger dollar. One attribute of Heritage portfolios over the course of 2018 has been a larger than “normal” allocation to cash, or short-term investments, in client portfolios. The increase in short-term interest rates from effectively zero earlier in this cycle to ~2% today with the strong likelihood that the Federal Reserve increases rates two more times in 2018 lessens the opportunity cost associated with maintaining a cash position. For the first time in this cycle, cash yields exceed equity market dividend yields while compensating investors for the impact of inflation. Given our expectation of a pick-up in inflation (see below) and the resultant increase in interest rates, we continue to be wary of taking maturity risk in client bond portfolios. Cash represents a source of stability for portfolios in a market with rising risk in both equity and fixed income markets. The Federal Reserve’s ability to maintain extraordinarily low short-term interest rates through this cycle has been enabled by subdued inflation rates, even in the face of the recent acceleration in economic growth. Our cautious view on longer maturity bonds is based on our interpretation of economic data that continues to support higher inflation in the future. Unemployment approaching historic lows (see chart below) coupled with an acceleration in fiscal spending supports this view. Tariffs, or a trade war, will only act to intensify inflationary pressures. As we enter the Fall, we are weighing the positive economic and earnings fundamentals of the domestic equity markets against risks both normal for this stage of an economic cycle (tightening labor markets, peaking(?) 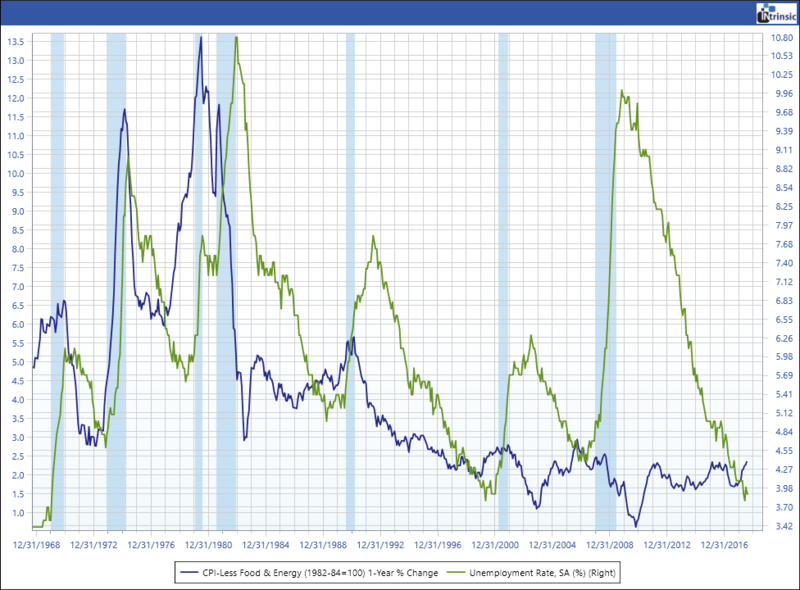 margins and growth, flattening yield curve) and risks specific to this cycle (political, trade). Client portfolios continue to be positioned in line with long term strategic allocation targets with a bias towards quality. However, we are exploring steps to mitigate potential portfolio risks as we move further into this cycle. It is likely that portfolio activity may pick up over the coming months.